Details: Protect your home and loved ones with a cartridge designed exclusively for home defense. Guard Dog packs terminal performance that stops threats while reducing over-penetration through walls. 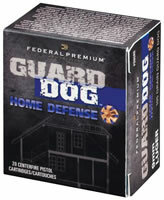 Guard Dog is the benchmark for defending home and family. Avaliable in 9mm, 40, and 45.